Cadogan is campaigning for Social Housing for young families in Strangford Village. Local families are being priced out of the market by mostly Belfast based holiday homers. With lack of employment opportunities locally, may are emigrating. “Firstly, I am not happy that some people have opposed this scheme from the point of view it involves ‘social housing’. There are over 20 local Strangford families on the housing list, and it is essential that locals are accommodated in the village at a time of unemployment, emigration with lack of availability of mortgages and borrowing capability to buy houses in the village. “The school is at the lower level of what would be considered sustainable, and we need families and children in the village not only for this reason, but also to support local shops, clubs, church and the social fabric of the village. Weekend visitors cannot replace local families in this way. 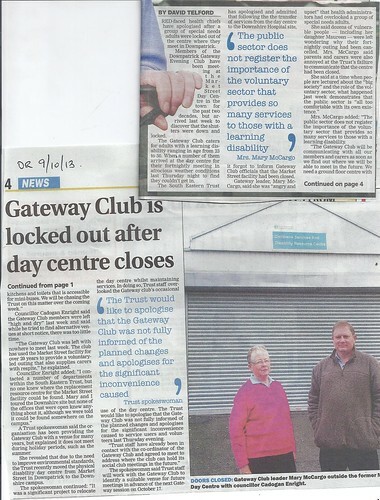 “Secondly, I do recognise that some people in the Links and Fairways have reservations about more traffic being forced down the narrow access road to Links and Fairways. I do see this as a real problem. As a result I have proposed an alternative plan to the Housing Executive which I have put on the back of the leaflet I attach below. My proposed amendments to the plan proposed for the new Housing Association are shown in blue. “Lastly, I do recognise that there is room for up to 6 or 8 brownfield units in the village centre in areas that are underused or derelict. However I consider this to me a matter of ‘and’ rather than ‘or’. I have asked the Housing Executive officers to come and look at these properties too. I circulated my ideas around the village in a leaflet, and attached a diagram on the back of it for easy understanding – this was very well received by the great majority of people across the Village. 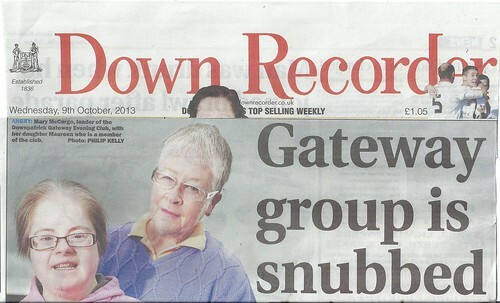 South Eastern Education and Library Board pretend that there is no yellow bus service taking children from all Lecale villages to school in Downpatrick, and thus claim they can’t run a special bus for Gaelic speaking children. 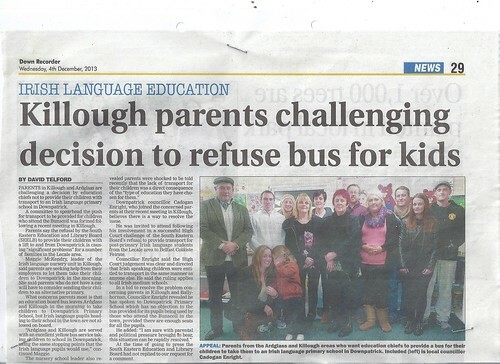 The South East Education and Library Board are refusing to allow Irish speaking children in Ardglass and Killough to use the yellow bus network to take children to school in Downpatrick. I spoke to the headmaster at Downpatrick Primary School, and he had no objection to the yellow bus service being shared if the SEELB make sure that there are seats for all. 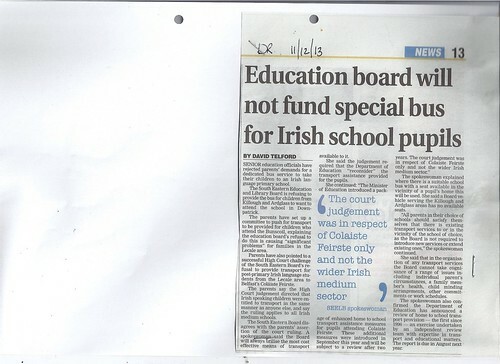 I had a similar case with Irish speaking secondary school students from Ballyhornan and Downpatrick being refused transport that I took to the High Court and won with the help of their school. Parents were shocked when the SEELB transport spokesperson them that SEELB were ignoring the High Court, and I am now bringing this to the attention of the Ombudsman with help from Unionist MLA John McCallister as sponsor. 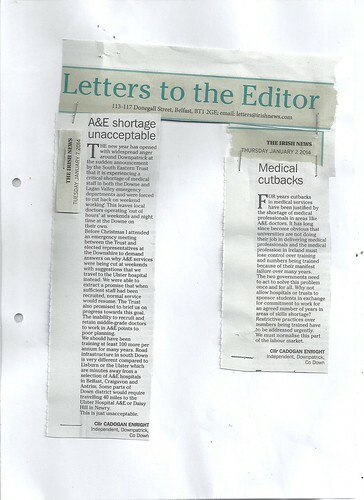 Johns role in sponsoring this complaint demonstrates once again why he is held in such high regard by both sides of the community – putting people first no matter who or what they are. An astonishing case of 1970’s style discrimination against children between 4 to 11 years of age whose only crime is to speak Gaelic. nov 6 2013 strangeford glebe house, a photo by CadoganEnright on Flickr. 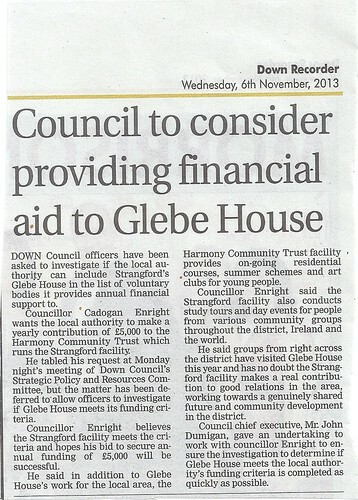 Cllr Cadogan Enright proposed that Kilclief’s Glebe House be included as one of the dozens of local community organisations that Down Council makes a contribution to on an annual basis.